​When a meteor hits the earth, containing a mysterious new power, a musical super hero is born! Johnny Jazz the Recorder Raider is a paperback comic book with a play along online component! Students will join in the story as they sing songs about each character and play recorder along the way to help Johnny Jazz and Ms. Melody defeat the evil Dr. Tritonian and his legion of Coda-bots! The Combo Pack includes both the Interactive Whiteboard Visuals USB, and a Student Edition paperback comic book. Your students will love being able to take home the colorful images and imaginative storytelling of this student edition book. * Students just head over to www.johnnyjazz.net and input the code from the book to practice and sing along online! The Portable USB Drive includes one SMART Notebook File, one PowerPoint file, karaoke tracks, and tons of printable visuals! 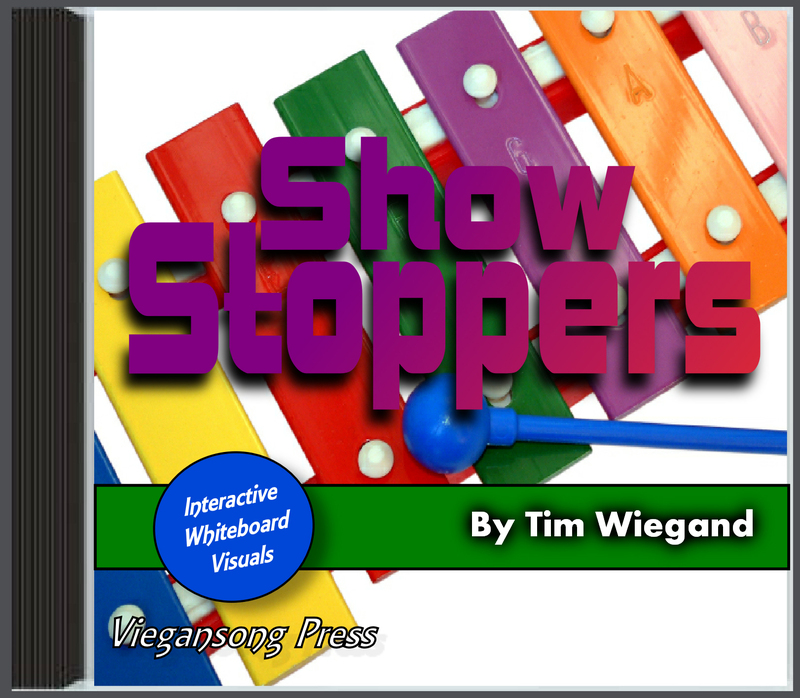 Show Stoppers is a songbook filled with ten performance pieces intended for Orff Shulwerk elementary music classrooms. This publication includes practical classroom adaptations and suggestions for performances. 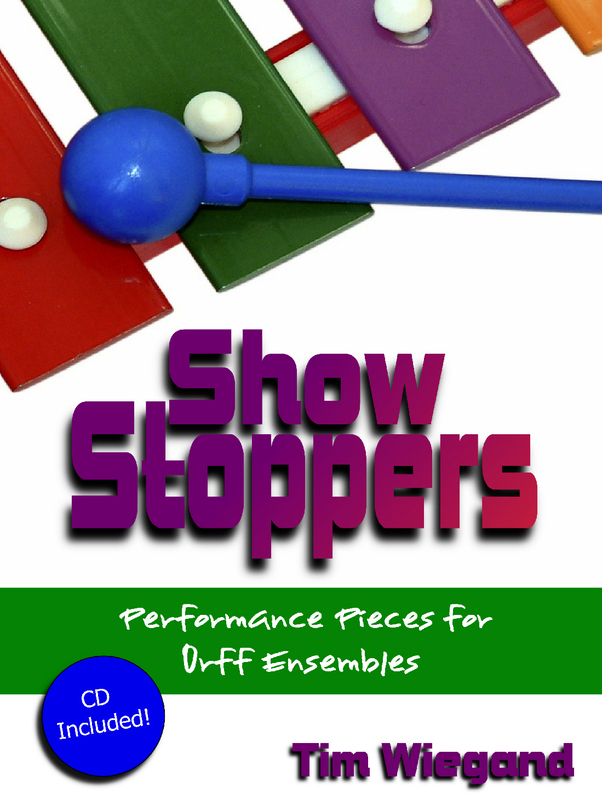 If you're looking for performance pieces to build an entire concert around, then Show Stoppers is the book for you! Show Stoppers also includes an audio CD to help guide your rehearsals or for use in the general classroom setting. Our recordings feature the talented young singer Caitrianne Bristol. On the CD you will also find a blank template to create the Powerpoint presentation for the song "Tender Care". Your kids will enjoy these creative, innovative, and exciting compositions. We take pride in our all of our publications and interactive whiteboard visuals! Check back soon for products that can enhance your students experience! If you're ready for something modern and new, join the Revolution! NOW AVAILABLE from Viegansong Press! Our second publication is an entire soprano recorder curriculum intended to get your kids motivated to learn how to read music! 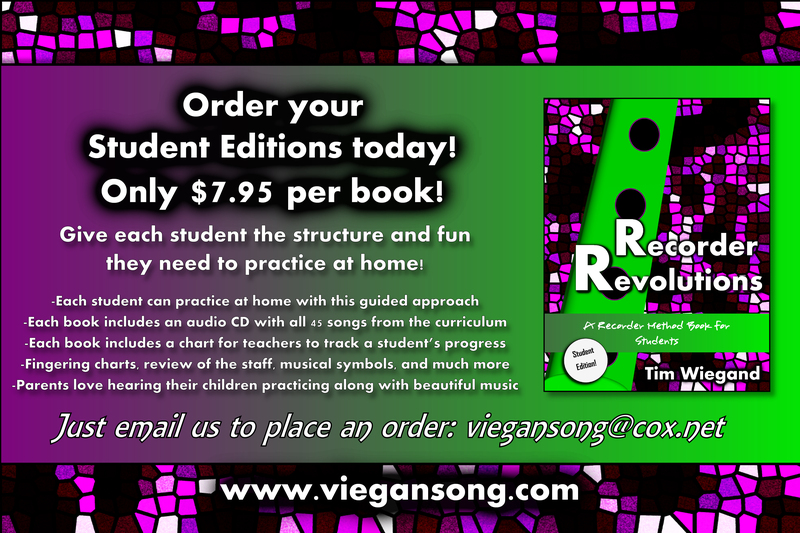 The teacher's edition will include songs, dances, games, and activities to help your students revolutionize their recorder playing. The book includes two audio CDs with modern play along tracks that both include and exclude the sound of the soprano recorder. 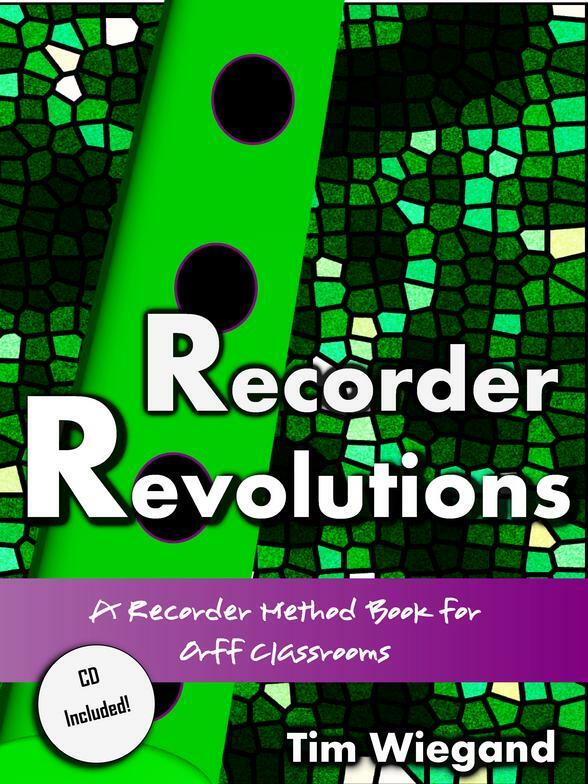 Your students will love this modern new approach to learning the recorder. Click our videos for free samples of the Interactive White Board Visuals! Once video loads right click on screen, then click zoom, then full screen. For best results use the browser Internet Explorer. Get your kids energized with engaging games and activities that work. Energize Your Music Room is intended for Orff Schulwerk classrooms, students will sing, dance, play instruments, create, and play exciting music games! The purpose of this book is to encourage both the teacher and the student to use their imaginations and bring back the joy of music class! Are you tired, do you go home worn out? 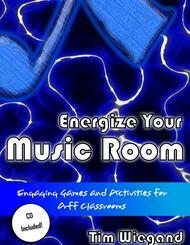 Energize Your Music Room also includes Tim Wiegand's complete classroom management plan for elementary music classrooms. You will be going home with a smile on your face in no time! This publication includes modern audio recordings that will be sure to get kids energized! Dr. King Had a Dream, Yeah! NOW AVAILABLE from Viegansong Press! The student edition is an affordable tool to help students become excellent recorder players in the comfort of their homes. Each book includes an audio CD with 45 songs! Students will enjoy playing all the songs they have learned in music class and teachers will love seeing their students improve at home! Parents will also appreciate this book, as their students will finally have some guided practice. The Student Edition DOES NOT include many of the features in the Teacher's Edition. This book is sold in class sets, please contact us to order yours! 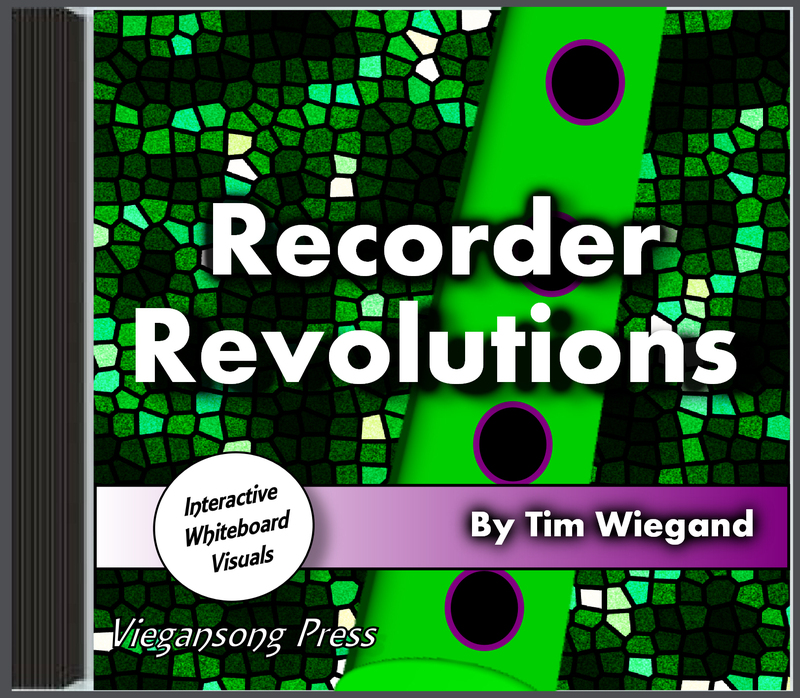 Wouldn't it be great to just project songs from Recorder Revolutions onto your whiteboard so students can read music together as a class? Our interactive white board visuals will make the teacher's job easier! Simply press play on the screen and off you go! Visuals include playable song tracks, teaching tips, recorder fingerings, question and answer visuals, lyrics, scored recorder parts, and musical form. The CD-ROM includes one SMART Notebook File, one ActivInspire Promethean file, one PowerPoint file, and over 130 printable visuals! Now available from Viegansong Press! If you love the book Show Stoppers, you will surely love the Interactive Visuals CD-ROM. Students and teachers will love the colorful interactive slides. Includes song lyrics, teaching aids, scores, individual parts, form, audio Files, and interactive lessons your students will love. It has never been easier to stop the show! *Includes SMART Notebook file, PowerPoint file, and over 215 printable posters! 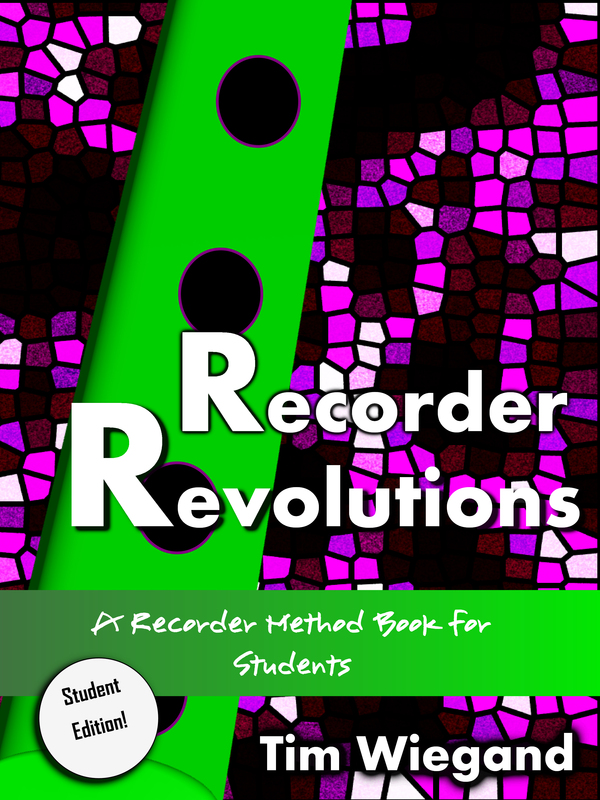 Click here for more information about Recorder Revolutions! NOW AVAILABLE! Save some money by ordering the Complete Kit today! 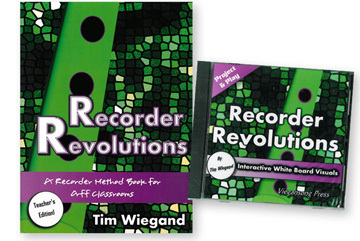 Includes the popular recorder curriculum text book & interactive visuals! NOW AVAILABLE! 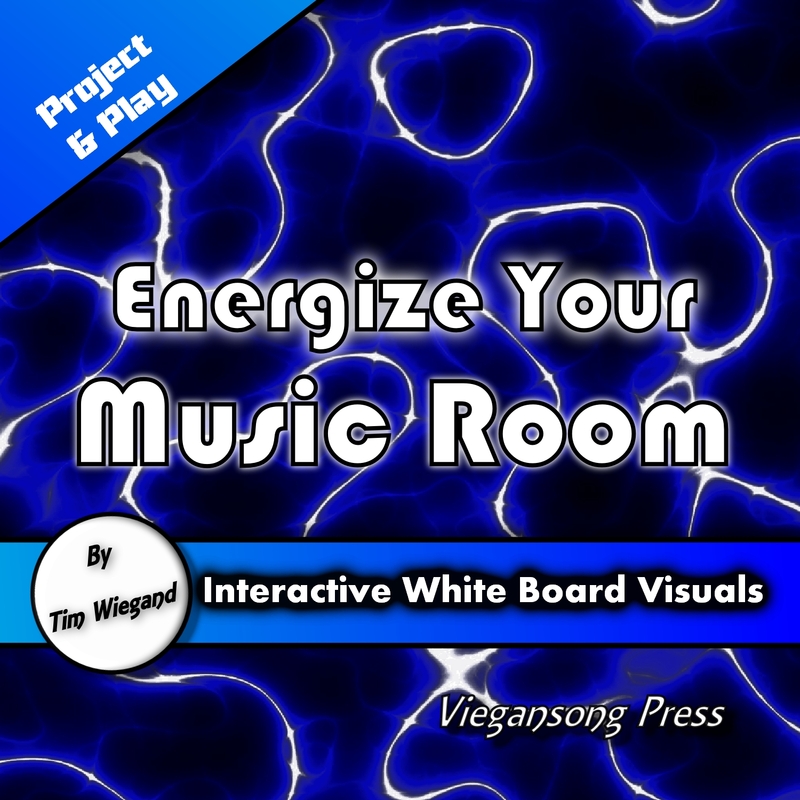 Wouldn't it be great to just project songs from Energize Your Music Room onto your whiteboard so students can read music together as a class? Our interactive white board visuals will make the teacher's job easier! Simply press play on the screen and off you go! Visuals include rules, procedures, playable song tracks, karaoke tracks, teaching tips, objectives, lyrics, scored instrument parts, video files, printable posters, and musical form. The CD-ROM includes one SMART Notebook File, one PowerPoint file, karaoke tracks, video files, and over 220 printable visuals! Now available from Viegansong Press! Johnny Jazz is a the next wave of exciting material for the elementary music classroom. When a meteor hits the earth, containing a mysterious new power, a musical super hero is born! 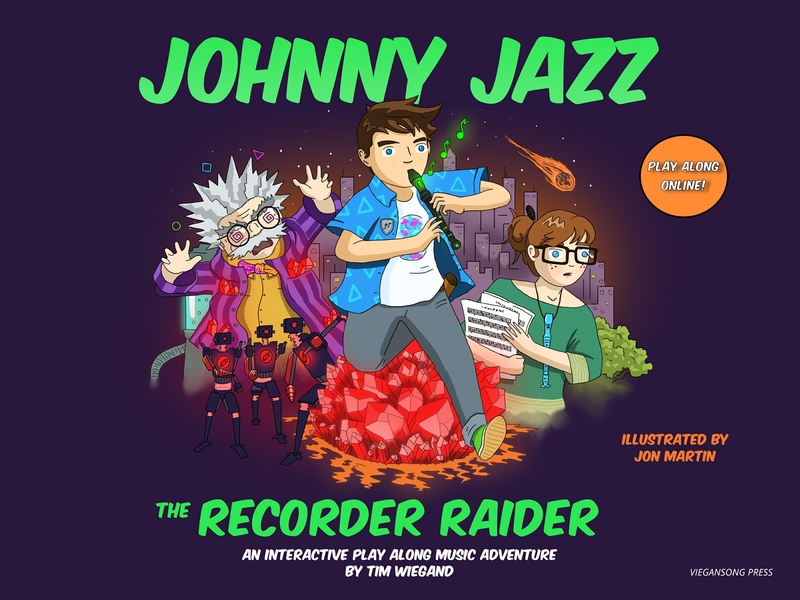 Johnny Jazz The Recorder Raider is a digital comic book musical and recorder curriculum! Students will join in the story as they sing songs about each character and play recorder along the way to help Johnny Jazz and Ms. Melody defeat the evil Dr. Tritonian and his legion of Coda-bots! Your students will love the colorful images and imaginative storytelling in this NEW genre of music lesson. 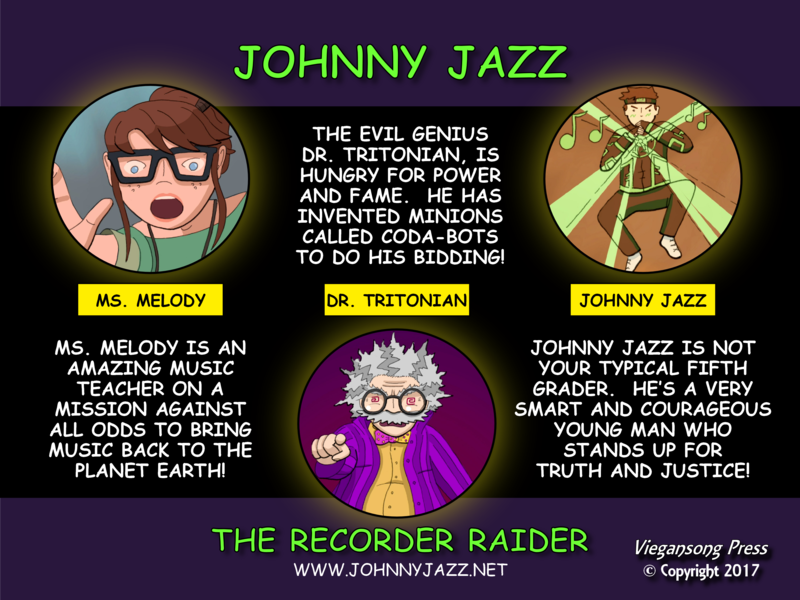 Johnny Jazz The Recorder Raider™ Student Edition Comic Book! ​When a meteor hits the earth, containing a mysterious new power, a musical super hero is born! 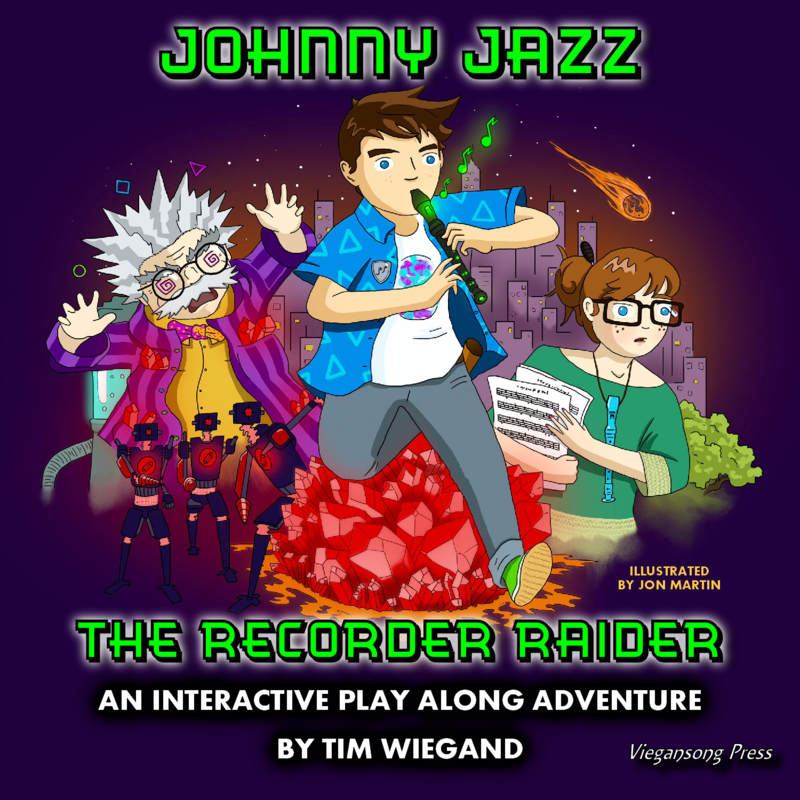 Johnny Jazz the Recorder Raider is a paperback comic book with a play along online component! Students will join in the story as they sing songs about each character and play recorder along the way to help Johnny Jazz and Ms. Melody defeat the evil Dr. Tritonian and his legion of Coda-bots! Your students will love being able to take home the colorful images and imaginative storytelling of this student edition book.